24-26 July 2014: International Workshop ‘Sign Language, Deaf Communities in Africa and Côte d’Ivoire: What Perspectives?’ See poster below or follow the link for more information. Aug. 2013 The second special session on African sign languages and gesture’ during the Conference on African Languages and Linguistics, Leiden University. Nov. 7 2012 Final EuroBabel Workshop ‘Rural sign languages: social and linguistic perspectives’, Leiden University, in collaboration with Connie de Vos, MPI, Nijmegen. 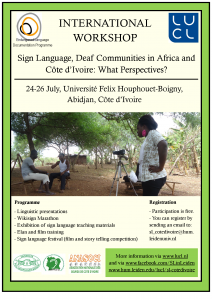 August 2012 The 2nd workshop on African Sign Languages during the 7th World Conference on African Languages at the University of Buea, Cameroon, in collaboration with main organizers S. Lutalo and Goedele deClerck, University of Central Lancashire. August 2009 The first special session on African Sign Languages during the Colloquium on African Languages, Leiden University. August 2009 The first workshop on African Sign Languages during the 6th World Conference on African Languages at the University of Cologne, Germany, in collaboration with Shane Gilchrist. April 2007 Organisation of the workshop “The typology of space in sign languages: Developing a descriptive format for cross-linguistic comparison”, together with C. De Vos, P. Perniss, & A. Ozyurek, as part of the international conference on Cross-Linguistic Research on Sign Languages (CLSLR 2), Max Planck Institute for Psycholinguistics, Nijmegen. August 2010 Special sign language program during the 3L International summer school at Leiden University, the Netherlands, a joint program of the universities of Lyon, London and Leiden [main organization]. Dec. 2012 Launching ceremony of the online corpus en PhD thesis of Adamorobe Sign Language at Adamorobe, Ghana, Dec 2012. August 2009 Deaf Africa Symposium, Leiden University, bringing together people and organizations involved in Deaf issues in Africa [main organization]. Dec. 2007 Organisation and execution of Deaf Empowerment training for 50 members of the Association Malienne pour les Sourds in Bamako, Mali, in collaboration with Annemieke van Kampen (MsC Deaf Studies) and Mariska van Zanten (interpreter NGT).